Yep, pointing out the dangers of dehumanizing people is “against community standards”. Huh. Who’d have thought it? So their standards require a community that will not admit that dehumanizing another human being can lead to terrible consequences? The abortion industry in the US has long since passed the number of innocent people murdered by the Third Reich at the instigation of the leaders of that regime, yet the supporters of this horrible procedure refuse to acknowledge that babies are humans too.. And to top it off we’re castigated by the powers that be for pointing out this simple fact. The folks that run Facebook are human, so I’ll not stoop to claiming they are not, but I WILL point out their hypocritical chastisement of those of us who urge people to recognize that ALL LIVES MATTER, while facilitating the spread of the fascist “ANTIFA” and “BLM” movements – among others. Nor do I agree with the current president’s statement that MS-13 gang members are “animals”. This, too, is dehumanizing. They are NOT animals, they are humans who have made some terrible choices. Yes, humans tend to do that, but dehumanizing someone who disagrees with you is not the way to go. What a weird community it is. Yet I’ll keep doing my little bit to let the light shine in the midst of darkness. Truly the only hope for this sad world that has allowed both the genocides of the World Wars and the genocide against the unborn to continue is the Gospel of Jesus Christ. 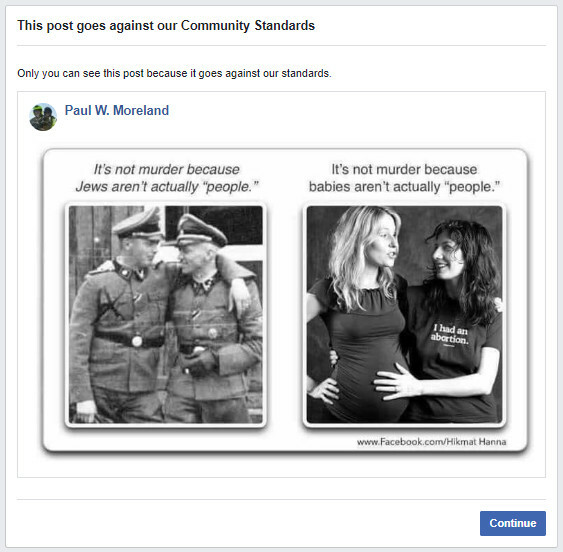 This being posted to my timeline may very well result in Facebook Jail again – but if they do so it will be an admission that to Facebook only SOME lives matter to them and only opinions that jive with their twisted world view are allowable by their censors in the supposedly free exchange of ideas.